This past weekend, I realized that dreams do come true when we got to attend the Marvel x Ippudo The Avengers Interactive Ramen Dinner. The most beloved ramen restaurant in New York joined forces with Marvel Comics to officially sponsor a meal and drink pairing (c/o Nanbu Bijin Sake & Asahi Beer) inspired by our beloved Avengers heroes. 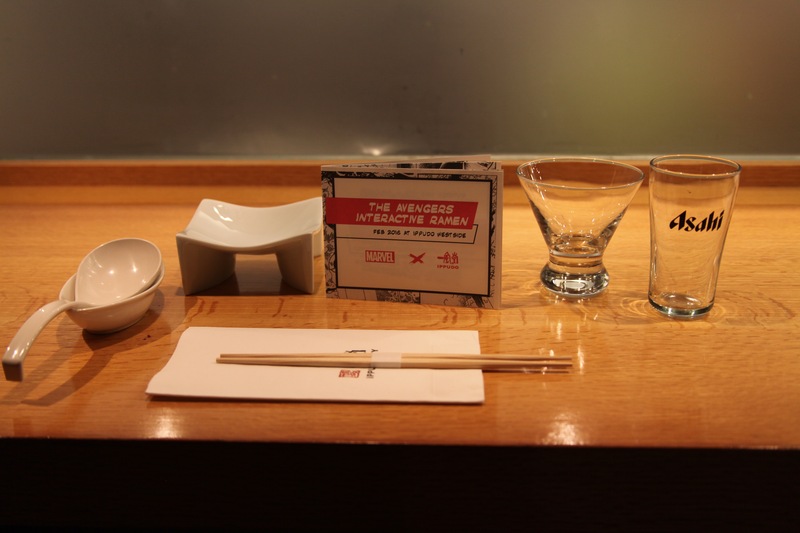 This event was hosted at Ippudo’s Hell’s Kitchen location (321 West 51st Street) on their secret second floor Ramen Bar on 2/25 – 2/26, limited to 40 seats per day. 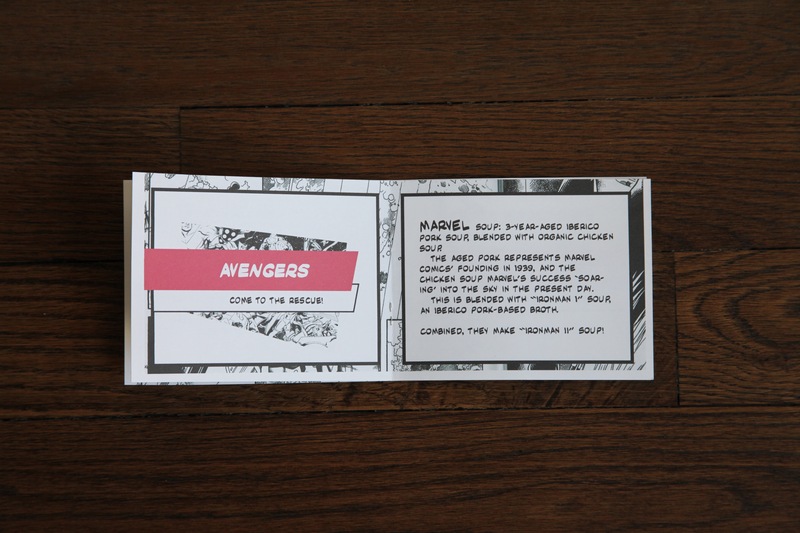 The Marvel x Ippudo The Avengers Interactive Ramen Dinner consisted of a drink pairing and bowl of ramen compromised of ingredients inspired by each respective hero in the Avengers. 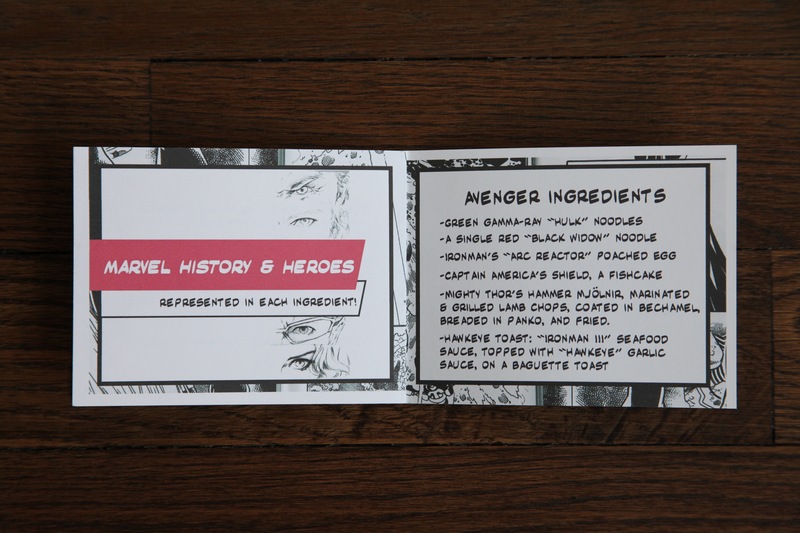 The meal was made interactive in that new ingredients were sequentially brought out to patrons to add to their bowls, all accompanied by a related story about the respective hero or the Avengers origin story. When we sat down, we were immediately poured a glass of the decadent Nanbu Bijin Ruten, made by the sake superhero Kosuke Kuji. We were then served a baby octopus that had been pickled in a sweet and sour brine and served on a cocktail pick to effectively make an alien cocktail. This movement represented an initial attack on New York City. We were then presented with a bowl of ramen served in a futuristic metallic bowl that reminded me of Captain America’s shield. This bowl contained a 3-year aged Iberico pork-based broth, which represented the founding of Marvel Comics in 1939. This Iberico pork-based broth was then blended with an organic chicken soup. This fresher blend represents Marvel’s meteoric rise in popularity throughout the years and its longstanding relevance in pop culture. Patrons were instructed to try the broth as is, then break the poached egg, then try the fried lamb chops, then mix in the seafood and garlic sauce, and finish off the bottom of the bowl with hot sauce. 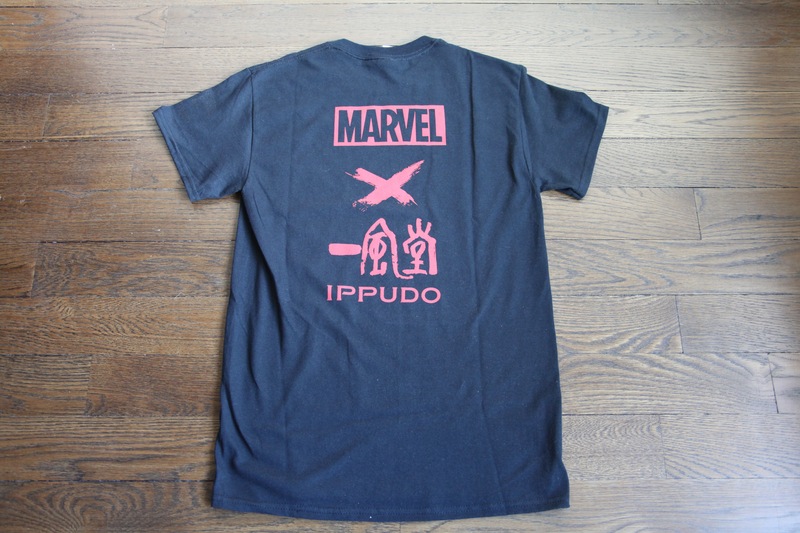 At the end of the meal, patrons received an exclusive Marvel x Ippudo shirt designed by comic book artist Matt Waite. In short, the meal was a dynamite meeting of the pop culture minds and I can’t stop thinking about those fried lamb chops. It’s awesome that these pop culture icons are able to experiment with each other in a way that excites everyone about comics and food. 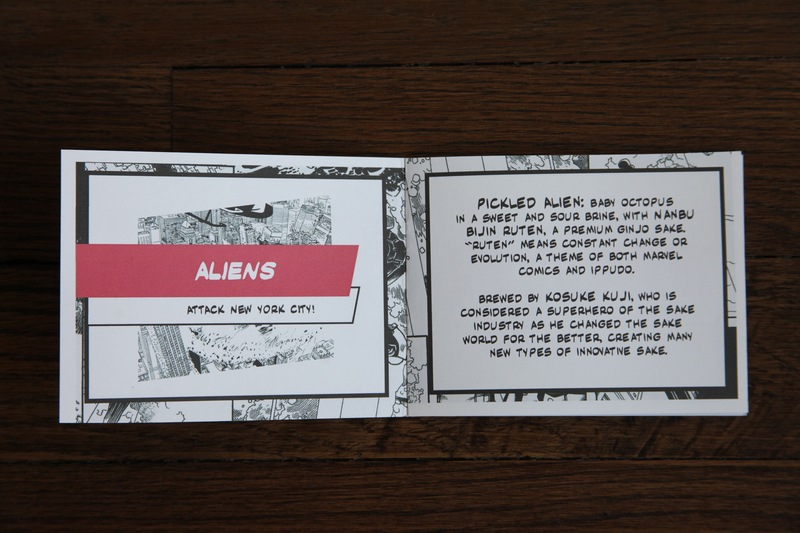 Fingers crossed that Marvel x Ippudo team up for a very apropos Jessica Jones meal to honor both the restaurant and show’s homes in Hell’s Kitchen! Marvel x Ippudo Avengers Interactive Ramen Dinner in Hell’s Kitchen West Side Ippudo. Share your thoughts on this with the hashtags #MarvelxIppudo and #PateSmith or share them in the comments for the chance to be featured onsite! This past weekend, we attended the Marvel x Ippudo The Avengers Interactive Ramen Dinner. 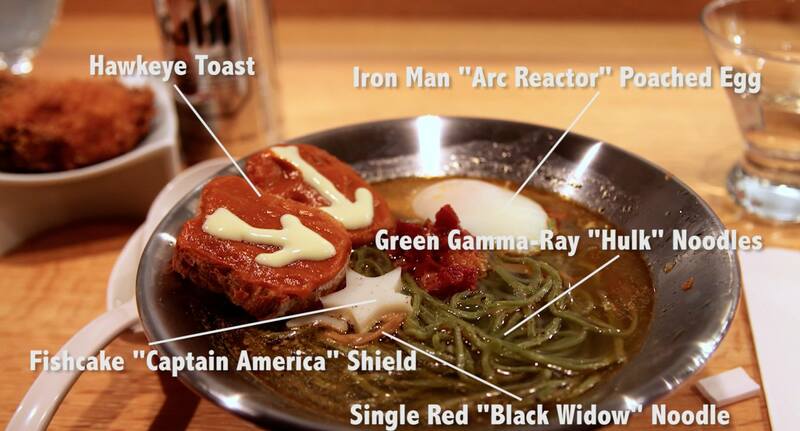 The ramen restaurant joined forces with Marvel to sponsor a meal inspired by our beloved Avengers heroes.